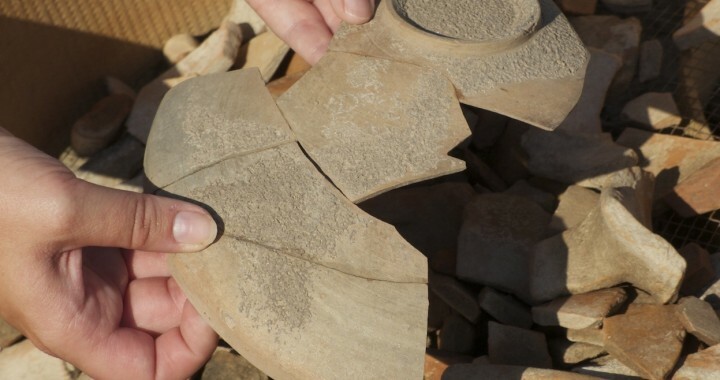 The case of the broken vase: how an archaeology team investigates Bronze Age life through detailed study of everyday items. For many millennia people have used ceramic vessels for the storage, preparation, and consumption of food and drink. Pottery's centrality to basic human activities along with its near indestructible material nature usually make it the most abundant material class uncovered by archaeological excavations. Of the samples found at Kaymakçı last year, 90% were ceramic when measured by either count or weight, with the remaining samples including material classes such as bone, stone and metal. Because of its abundance, the careful recording of the ceramics is a team effort (see photos). Each day, team members study such characteristics as the shapes, colors, and clay fabrics of the ceramic vessels. 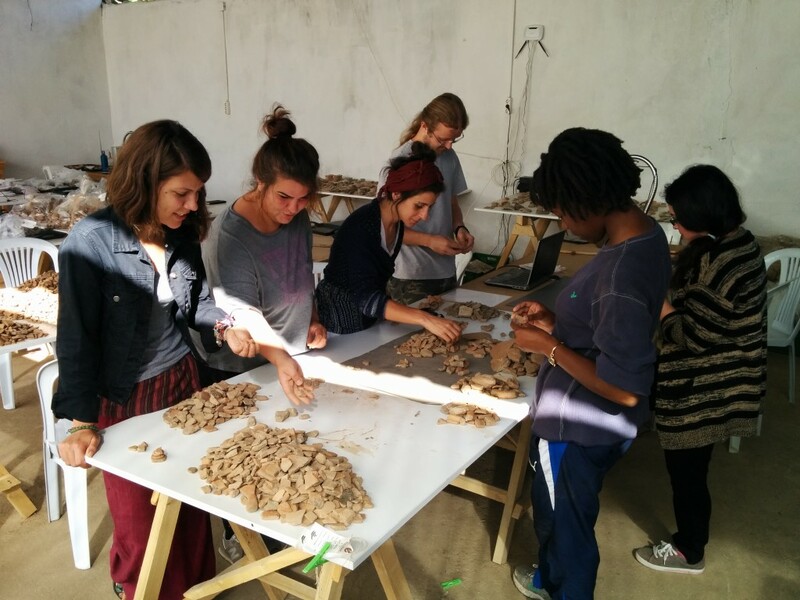 The team sorting a context of sherds. Continuing the careful and detailed digital recording done with field stratigraphy, we also apply a set of technologies in the lab to record information about ceramics accurately and efficiently. Thus we use Pantone Capsure devices to measure colors digitally and a NextEngine portable 3d laser scanner to record shape. In this way, we can most objectively compare each ceramic sample both with each other at our site, as well as with the published materials from other nearby sites. 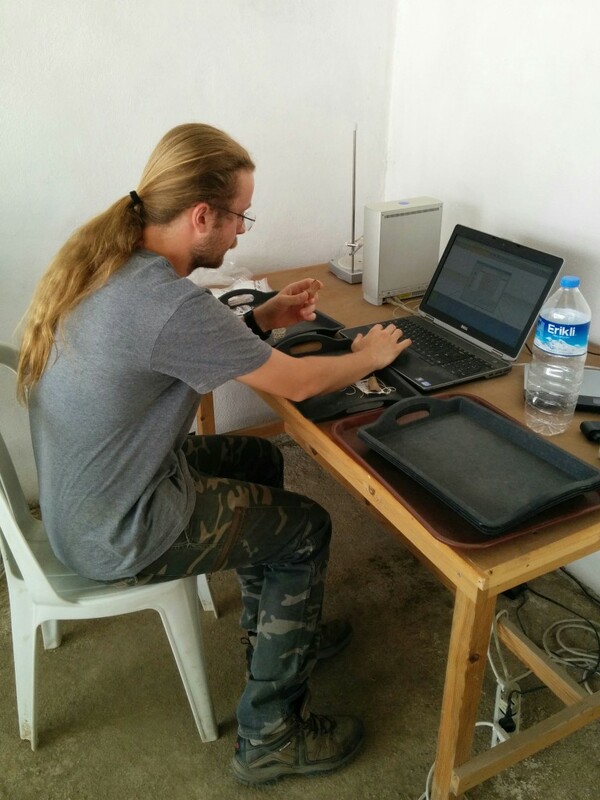 Lab co-manager and Ege University student Tunç Kaner 3d scanning a ceramic sherd. Gygaia Projects has always strived for scientific rigor in the study of pottery. Research led by project co-director Dr. Christina Luke analyzed survey ceramics from Kaymakçı and the surrounding region typologically, chemically, and mineralogically. This has provided a very interesting picture of the social, economic, and political history of the region, a picture that is detailed in an article in a fully Open Access issue of the Journal of Field Archaeology, already available online (http://www.maneyonline.com/doi/abs/10.1179/2042458215Y.0000000009)! Posted in Ceramics, Excavation, Technology, Visualization, Voices.